Macclesfield have released midfielder Lewis Chalmers as they are unable to offer him a new contract. The 27 year old signed a one month deal at the start of September, but only made two sub appearances in the month. Luton have signed Portugese midfielder David Viana after receiving international clearance. The 21 year old has played in France, Portugal, and the US prior to joining the Hatters. Gateshead have released defender Lewis Galpin. The teenager made eight appearances for the Heed towards the end of last season but has been out on loan with West Auckland this season. Kidderminster defender Mickey Demetriou has been sidelined for six weeks with a fractured wrist. The 23 year old has been a regular this season. Former Bulls physio Wayne Jones has left Newport. The 64 year old wants to be closer to his family in Kent after two years with the Exiles. Carlisle have named caretaker boss Graham Kavanagh as their permanent manager on a deal until the summer of 2015. The 39 year old won all games as caretaker boss after the Cumbrian side failed to win any of their opening eight games this term. Bulls News understands that both Michael West and Paul Green have returned to their parent clubs. West returns to Crewe after seven starts, and one sub appearance, during his month with the Bulls. He also scored in the game at Gateshead, but is now deemed surplus to requirements by the Bulls. Green returns to Forest Green after the Bulls failed to agree a loan extension with the footballer-hoarding side. Green, 26, played seven times for the Bulls and forged a solid partnership with Kingsley James in the last two matches. The Bulls are understood to be looking for a loan replacement for Green with Frankie Artus and Josh O'Keefe still out injured. Hereford United’s U18’s defeated their Newcastle Town opponents 2-0 in this evening’s FA Youth Cup match at Edgar Street with Tom Brock notching twice late in each period. Credit must go to the Youth management team of Peter Beagle and Steve Jenkins and also the Newcastle Town coaches for producing teams that were well drilled and, perhaps more importantly, good to watch. How refreshing to watch footballers go into crunching tackles and jump up to carry on the game rather than rolling around in apparent agony at the slightest glancing challenge. The keenly contested first period, in which the young Bulls controlled possession, was highly entertaining and finished with Hereford leading by the only goal of the half. Jarrod Bowen’s low cross from the right was neatly finished at the back post by Tom Brock. After the break, with the visitors visibly tiring, The Bulls continued to boss the play but it was not until late in the game that the match was sealed. A tremendous overlapping run by fullback Cory Saunders and some great interplay finished with a cross that Brock met with a sweet strike. At the whistle, around 200 spectators warmly applauded both teams off the pitch. Hereford United: Clarke, O'Kelly, Saunders, Murphy, Haines, Kontic-Conveney, Bowen, Brennan, Williams, Bonella, Brock. Subs: Miller, Gregory, Burgess, James, Evans. An impressive Hereford United Youth team defeated Newcastle Town 2-0 in the FA Youth Cup match played at Edgar Street this evening. Tom Brock scored both the Bulls' goals. Barnet have been handed an enforcement notice by Harrow Borough Council over their oversized stadium. The Council are to give the club six months to demolish their West Stand, and three months to remove the floodlights. Both were erected larger than the club had applied for planning for, and a retrospective application for the larger structures was rejected at the start of the month. The club still retains a right of appeal against the rejection of their planning application, which local residents campaigned against with the floodlights reported to be 10 metres taller than originally designed. With the news that HUISA intend to purchase some 'new' shares in Hereford United, BN looks back 14 years to late September 1999 when HUISA first bought shares in the club. THE HUISA committee are pleased to confirm that 2,276 shares in Hereford United have been secured in trust for the supporters of the club for future generations. In accordance with our constitution, and following a fully democratic postal ballot of our members held in September 1998, the committee has been actively seeking available HUFC shares in the market to comply with our members’ mandate. With the resignation of Mike Hancocks from his position as director of HUFC, the first opportunity arose for supporters to obtain a sizeable ownership stake in the football club. The committee unanimously voted to purchase 2,276 of Mike Hancocks’ 2,845 share-holding. Whilst the purchase of 2,276 shares does not fully meet the ongoing aim of acquiring 4,000 shares in HUFC ie. 10% of the total share issue, HUISA is delighted that this holding does represent approximately 10% of the active shares as detailed in the company register. The price paid for these shares was £4,000. Such is the commitment of the HUISA committee that in the event of a ‘club emergency‘, HUISA will always respond in the manner our members have come to expect. As a result of the changes and pressures currently affecting football clubs Nationwide, HUISA recognise the importance of HUFC in the local community. Supporters have a right to be involved in the major decisions that will have a direct impact on the very future of HUFC. Many obstacles face the club, in both the short and long term, and HUISA feel that the club’s dedicated supporters can now play an even greater role in HUFC as it moves towards the next Millennium. HUISA has built up a close working relationship with chairman, Graham Turner, and company secretary, Joan Fennessy over the past 2 years, and this share purchase is designed to further strengthen the ties between the club and its supporters. Graham Turner has been quick to recognise the support the club has received from HUISA, both financially and in day-to-day operational terms. HUISA is encouraged that this support has been recognised by the club as it is now the official supporters association of Hereford United. HUISA is also affiliated to the National Federation of Football Supporters Clubs and will use whatever influence it can exert within this body to further promote HUFC and the plight of smaller clubs generally. The recent speculation concerning a possible relocation of the football club to the Racecourse site further emphasises the need for supporters to play an active part in shaping the future. HUISA will endeavour to foster trust and greater communication between the club’s supporters and the Board of Directors using the regular Liaison Committee meetings as a means of advising the club of the fans’ ideas and concerns. It is envisaged that the purchase of shares in the football club will further safeguard the club for future generations of supporters, giving them both a stakeholding and a voice in the major decision making for the future of Hereford United. The HUFC FA Youth Cup match against Newcastle Town kicks off at 7.45pm tomorrow (Monday) evening. Admission is likely to be through Addison’s bar with adults entry set at £5 and £3 for concessions. Bulls News' very own Kevin will be running the Cardiff half-marathon on Sunday 6th October raising money for the Adam Stansfield Foundation. The former Hereford United striker passed away on the 10th August 2010 from colorectal cancer. Adam was an extremely popular figure in the changing room and with the fans alike. The promotion of community participation in healthy recreation for the benefit of children and young people up to the age of 16 residing in Devon, Herefordshire and Somerset by the provision of grants and facilities for playing football. If you would like to donate to Kevin's cause, then please follow the link below. The HUISA coach to Cambridge on Saturday 5th October will depart from Radford's at 9.00am. The fare is set at £20 (non-members £22. 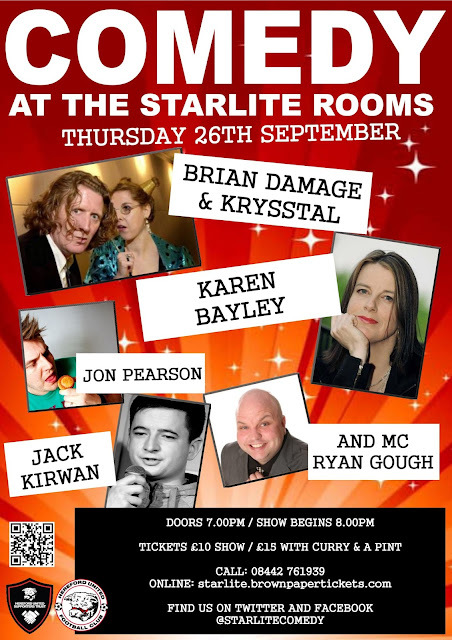 Seats can be booked through the Club office (08442 761939). For Macclesfield on Tuesday 8th October, departure will be 3.00pm with a fare of £16 (£18). Michael Rankine is not expected to be fit enough for the away game at Cambridge next Saturday. The big striker sat out yesterday's game with his hamstring injury which reoccured after coming on as a sub at Halifax a week ago. Rankine told BN that perhaps the Halifax game had been too soon for him, However he hoped he would be back in two weeks. HUISA, the Hereford United Independent Supporters Association, are to purchase 'new' shares in the club. Until last Thursday when the new share issue was agreed, HUISA had owned about 7% of the club. But with the possibility that anything up to 2.8 million new shares could be issued their percentage ownership of the club's shares will drop. Yesterday during the half-time break HUISA issued the following statement. HUISA today pledged on the pitch to purchase 8000 shares at a cost of £2000 in the new share issue. This was in agreement with members, made at HUISA’s AGM in August. Due to the sums involved, HUISA will be unable to take advantage of their full allocation at present but will continue to purchase further shares as and when finances allow. Meanwhile HUISA sold over 600 of their 50/50 tickets at yesterday's game which meant that they had two winners of the draw. The first prize was £300 and the second prize was £18. A selection of pictures from the second half of the game between Hereford United and Luton Town. Following on from Tuesday’s win against Lincoln, Martin Foyle opted not to tinker with the starting XI but a substitution late on in the game, did provide Eric Odhiambo with his home debut. The Bulls could have opened their account after just 6 minutes when Hereford won two consecutive corners. Michael West took the corner short, and after a one-two, his cross was blocked and went out for a corner. West again took the corner short, which Chris Bush delivered into the heart of the box, the ball was half-cleared to Kingsley James whose shot was saved. During the first half, Hereford huffed and puffed but struggled in the final 3rd. Danny Leadbitter sent the ball long down the right wing for Jon Brown to chase. He controlled the ball well but scuffed the cross which was dealt with by the Luton defence. The Bulls continued to create opportunities as Sam Smith sent Richard Brodie on his way only for his shot to be blocked by Ronnie Henry. The resulting corner by Michael West was cleared by McNulty. United had the upper hand in the first period as Luton’s 4-4-2 formation didn’t seem to be working for them. After Bush had received the ball on the left, he ran up the centre of the field to allow Brown to cross the ball into the box. A Hereford man was not on hand as the ball was cleared by Luton’s defence. Jon Brown continued to impress as he got past two of three sliding Luton men only to be finally brought down by Jake Howells. Graham took the free kick short to Brown who, again, managed to get his cross in but was headed clear. As the half drew to a close, Hereford had arguably their best chance so far after Brodie broke away and delivered in a cross from the left. Griffiths cleared the ball, but only as far as West whose shot went just wide of the upright. One final opportunity for the Bulls arose on 45 minutes after Leadbitter had been fouled by Griffiths, who was booked instantly. James crossed the ball into the box after the free kick, but Benson cleared. In the second half, Luton instantly appeared to be stronger than they were earlier after a slight change in their formation. After just five minutes, Luton were challenging Hereford’s defence as Howells had a shot on goal, but Evans was in the right position to make a comfortable save. Foyle made his first substitution swapping Smith in favour of Walker. Walker then attempted to get his name on the score sheet immediately, after James’ pass allowed him to get a shot away, but his low shot was well wide. Guttridge came close to providing Luton with the opener when Henry’s cross allowed him the chance to volley. Evans launched himself into the air so he could tip the effort over the crossbar. Luton again, failed to capitalise after skipper Henry’s cross was cleared for a corner. The corner was easily dealt with by the impressive James. Following the introduction of Pilkington to the action, Hereford had bodies in the box and the chance to take the lead. Pilkington crossed the ball into the heart of the box, and after a goalmouth scramble, Luton’s Smith managed to clear the ball up field. Pilkington was involved again as the Bulls created another chance. Pilkington’s corner from the right saw Brodie’s effort being denied by the post. The ball bounced to the feet of Graham who could only watch as his effort go wide. Many fans were happy to see Eric Odhiambo make his home debut as he came on for the tiring Brodie. Odhiambo could have opened his Bulls account following a Pilkington corner. The corner was sent deep into the box and Odhiambo was waiting at the back post to tap it in, but the ball harmlessly went out for a goal kick. With only a few minutes left of the game, Hereford continued to send the ball into the 18-yard box but both Odhiambo and Walker failed to threat travelling keeper Tyler. This was another solid display by the Bulls in which both defence and midfield looked very capable defensively and do not look like shipping many goals with this 4-4-2 formation. Unfortunately, as no doubt Martin Foyle knows, work now needs to be done in the attacking third of the field. All in all, the performances of late suggest the team is now heading in the right direction. Hereford: Evans, Leadbitter, Bush, McDonald, Graham, Green, James, West (Pilkington 64), Smith (Walker 51), Brown, Brodie (Odhiambo 80). Unused – Collins, Gwynne. Luton: Tyler, Smith, Griffiths, McNulty, Lacey, Parry, Smith, Guttridge, Howells (Whalley 88), Cullen (Gray 70), Benson. Unused: Charles, Taiwo, Justham. Attendance 2386 including 500 from the airport. A selection of pictures from the first half between Hereford United and Luton Town. A selection of pictures from before kick-off at Edgar Street this afternoon. Hereford United manager Martin Foyle thought today's goal-less draw against Luton at Edgar Street was a 'very, very well earned point'. Nevertheless the Bulls only had one shot on target which Foyle noted. "The lads have worked very hard," Foyle told BBC Hereford and Worcester. "There's a few in the team that have played three games very very quick and it looked like it caught up on them today. "When you're unbeaten on two you don't want to change a winning side. "I thought the defence was outstanding, the goalkeeper brought off a couple of great saves at the right times and the midfield too. "I thought Greeny was tiring, Kings three games in a week after being out, fair play to him. "My criticism is probably with the front boys at the moment, not making it stick. "The good thing is it's not just one, it's all of them. "The last ball, the last bit of hold-up play, a bit of anticipation, go and have a fight with the centre-half, put your arms and body into people. "And we probably had the best chances, we had a couple in the first half, then Bodie hit the post and Eric had a great chance around the back to stick one in. "0-0 against Luton Town the favourites you can't complain but if we don't make our front boys better then we are going to have problems." The Bulls stuck to 4-4-2 this afternoon. "We've had to go tight because we've been conceeding sloppy goals and we did have a spate of probably three or four games conceeding twos. "Now we've gone to the clean sheets and ones, if you do that you've got a great chance of winning a game of football." The Bulls have a week off until next SaturdaY when they travel to league-leaders Cambridge United. "We've got a week now to rest up and to be honest four of five need a good rest." Foyle was then asked about the two loan players, Michael West and Paul Green, whose loan spells finish this weekend. "I've spoken to them but it was a case that I had to get through today's game because we've had so many injuries in so many different positions. "We trained yesterday and Dom Collins fell down and his shoulder popped out, right I've got to get a centre-half. "It's been a nightmare, it's been a long week especially with the tribunal and the games we've gone to and the games we had. "I'm going to put my feet up for a day then go and watch a couple of games. "The loan market is going to be important for us." Below are the main stats from Edgar Street where the game between Hereford United and Luton Town finished goal-less. Attendance: 2386 with 580 in the away areas. Conference Table: Hereford move up to 14th position. The Bulls move up a place to 14th in the table after today's results. Cambridge now lead the table by five points after a 1-1 draw with Wrexham, while Nuneaton lost again going down 2-0 at Woking. Kidderminster are third after last night's goalless draw with Aldershot, with Grimsby up to fourth after a 3-1 home win over Tamworth. Braintree are into fifth after beating Alfreton 3-1, with Luton sixth after the goalless draw at Edgar Street, and Lincoln seventh after their 3-0 win over winless Hyde. Hyde continue to prop the table up, with 10 points to safety now required. Chester are 23rd after losing 2-1 at Halifax, with Aldershot 22nd, and Woking up to 21st. Wrexham are 19th after their draw, with Macclesfield moving above them after beating Welling 2-1. Gateshead remain in trouble after losing 1-0 at Forest Green, but Dartford moved up the table after beating Southport 1-0. 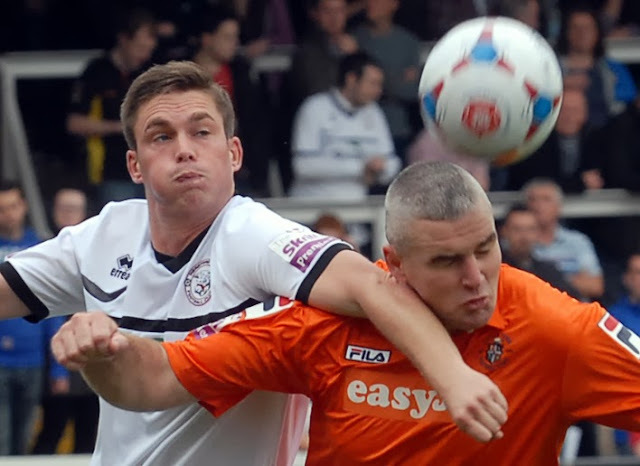 The Bulls claimed a point with a battling performance in today's 0-0 draw with Luton at Edgar Street. The same XI from Tuesday held firm against some strong Hatters pressure to halt their three match winning run. Hereford United chairman David Keyte was very disappointed with the outcome of two tribunals earlier this week. They took place to decide the transfer fees for Ryan Bowman and Sam Clucas who left Edgar Street at the end of last season. The Bulls are to receive £20,000 for Bowman, who is now at York, and £15,000 for Clucas. Should he make 15 appearances for his new club Mansfield Town, another £5,000 will be paid. "We had written proof of an offer of £30,000-plus from Crewe for Clucas, a verbal offer of £25,000 from Port Vale and a strange one, late in the day, of £40,000 from Nottingham Forest," said Keyte as reported by the Worcester News. "Those are three other clubs who have put a value on the same player, compared with Mansfield’s offer of £7,000. "I really thought that the Crewe deal, which we had accepted, would be the logical conclusion. "We felt that there might have been £50-60,000 in it for us for Bowman and the Clucas deal was a big disappointment. "The panel was keen to say that Clucas had only been here 18 months so queried how much we had been able to develop him yet, bizarrely, did not push the same point with Bowman who had only been here 10 months. "Ultimately we have ended up with more for Bowman than we have for Clucas." The biggest gate of the season to date is expected at Edgar Street this afternoon for the visit of Luton Town. The Hatters are expected to bring a decent following with them, perhaps as many as 800, and coupled with Hereford's recent improved form, it will be disappointing if the attendance doesn't reach around 2,500. The hospitality areas of the ground will be busy this afternoon with sponsors and childrens parties, no doubt partly reflecting the importance of this game. One player is also celebrating his birthday. Rob Purdie is 31 today. Meanwhile for any supporters unable to get to the game, there will be live coverage on both BBC Hereford and Worcester and Bulls Player. Finally, most shareholders will have received a letter from the club in the post this morning. In it are details of the offer of new shares in the club and an acceptance form. Conference betting guru Alan Alger expects Luton to beat the Bulls tomorrow - as does the NLP's Stuart Hammonds. Three wins on the bounce for Luton – but are they back on track? Two of the wins were against sides destined for a finish in the bottom eight, the other was a hard fought home win over Lincoln. That makes this game at Edgar Street pivotal – win here and I truly believe The Hatters will be challenging for the title for the final ¾’s of the season. With seven clean sheets so far, Luton are up there with leaders Cambridge as the shut-out kings and Hereford, who have only scored four times in their last five matches, don’t look to have the ammunition to trouble them. With Paul Benson back fit and Mark Cullen in fine form with four goals in two games as his stand-in, the Hatters have plenty to get the win. Earlier this week Hereford United's Bob Pritchard wrote a column for the Hereford Times in which he gave an update on the development news from Edgar Street. Given the importance of the leases to the club, particularily with the 'new' share issue in mind, here's his article. THE board of directors’ number-one priority is to secure the leases with Hereford Council to procure development of the Blackfriars and Meadow End development with the security of a long stadium lease. We have worked for the past seven months with our solicitors and advisors and, while this project has taken longer than expected, a six-hour meeting on September 9 seems to be bringing the process to a conclusion with many points agreed. The delay has mainly been caused by a change to the way the leases are to be created to avoid any future tax liabilities. We believe this is now resolved. The club will now enter into three separate leases for 30 years with the right to extend these to 250 years on the disposal of any of the development land at either end. Previously, we would only enter a 30-year lease on the development land when a developer was identified. We hope to now complete the drafting to engross these documents around mid-November. I have also been dealing with existing telecom- operators leases to provide us with a free and unencumbered site on disposal of the development land. As previously reported, we have draft schemes for a 2,000-capacity covered standing terrace at the Meadow End and a 1,200-capacity seated covered stand at the Blackfriars End with associated refreshment areas, toilets, bars, storage areas and disability facilities under, all sited closer to the pitch with reliable cost plans together with demolition costs and new floodlight costs. So with estimates for services and new access positions, we know the likely costs for this work. Grant funding, for the Conference, is a maximum of £400,000 for the site. That allows an allocation of £200,000 per stand, but should we gain promotion back to the Football League this will increase to £750,000. The proceeds from the sale of the land will be held in an escrow account for use only for the development of the stands. Currently this would appear to be short of the full costs but we continue to seek best value. The Blackfriars development would provide 60,000 sq foot of commercial space over five storeys and interest continues from hotel users, offices and some retail use, with residential a consideration. The Meadow End development would provide 24,000 sq ft of residential space over four storeys with associated parking. It is proposed to joint-market this site with the council land to achieve best value as there will be an improved marriage value for both sites than it being a stand-alone project. With a short-fall for these projects, funds from the share issue will help tremendously to complete these works and give us a stadium to be proud of. The board have been looking at ways to retain interest in the development areas and I am discussing proposals with joint-venture companies so that we can retain an interest in the project and some financial share to provide a steady income to the club. A new three-year lease, running from June 2014, has been agreed, in principle, with the trustees at Belmont Abbey and a new 10-year lease at Victoria Park is in final draft form, securing much-needed training facilities. However, the Aylestone Park project by HUFC community trust has been delayed until the New Year. There is plenty to do and I’ll let you know more when we have signed the leases. Hereford United take on Luton Town tomorrow afternoon at Edgar Street and currently the bookies appear to expect the Hatters to take all three points. However BetVictor are the only bookmaker offering 23/10 for a Hereford win, most others are around 2/1. The 13/5 for a draw is on offer with Bet365. Meanwhile Richard Brodie is priced at 13/2 with Bet365 to score the first goal of the game.. The latest edition of "The Bull" programme will be available tomorrow for the game with Luton. The Trust will once again be in Addisons bar tomorrow before the game verses Luton to take memberships & merchandise orders. Tony & Gary will be on the table in the skittle alley from 1.30pm to 2.30pm and both look forward to taking as many memberships & orders as possible, as all the funds taken go directly into helping us to achieve our aims, and by becoming a member of our trust you will then have a voice to say which direction you feel that we should be heading and you are even able to stand for any of our board positions at our AGM on 14th November. You will need two members to nominate you for this role, so bring two mates along with some cash and get them signed up too! See yesterday’s article (here) regarding our merchandise. We are also happy to take donations on our table, whilst if there is anything you would like to know about the Supporters Trust, our dedicated working group will be available and on hand to answer any questions you may have. So, what is stopping you? If you are at the game tomorrow, have a £10 note spare and sign up for the great movement that is HUST. Can’t make the game tomorrow? You can still sign up online, click the membership form tab at the top of the page and proceed. Hereford United manager Martin Foyle would like to see the midfield partnership between Kingsley James and Josh O'Keefe restored as soon as O'Keefe is fit. "I'm not going to hide from the fact that we had a problem last year with the midfield," Foyle told BBC Hereford and Worcester. "We had five players and couldn't get a two out of them. "But when Josh and Kings got together you could tell they've got that rapport, they worked hard and we certainly missed them. "So to have those two missing from the first chunk was a big blow to myself, but it does give other people chances." Meanwhile it's reported that there no fresh injury concerns in the squad for tomorrow's game against Luton. Finally Foyle will decide whether he would like to keep Paul Green and Michael West at Edgar Street for another month after tomorrow's game against Luton. Brodie "Luton Fans Public Enemy No.1"
Brodie, May 2010, evading Luton fans. Luton fans will probably be a little vocal about Bulls' loanee Richard Brodie tomorrow. While the Bulls will have former Hatters Dan Walker, who left Kenilworth Road for Edgar Street in the summer, and Luke Graham, a former Luton loanee, in their ranks the fans' ire will be pointed towards Brodie. The 26 year old has netted four times against the Hatters down the years, and was part of the York side that beat the Hatters in the 2010 play-off semi-finals - a tense pair of matches that ended with the York players escaping through their own fans to avoid a violent pitch invasion at the end of the second leg at Kenilworth Road. Upwards of 1,000 Luton fans are expected to descend on Edgar Street tomorrow with the Hatters on a run of three straight wins. After early season grumbles, the Hatters' fans are in a better mood following wins over Woking, Lincoln, and Dartford. They have netted 10 times in the process and only conceded against the Imps. A large away following usually helps to bring out a few more Bulls, with Tuesday's disappointing gate against the Imps hoped to nearly double in total. Despite netting four against Woking on Tuesday, the Hatters are hoping to have striker Paul Benson back in their squad for tomorrow. The 33 year old has scored three times against the Bulls over the years, each time resulting in a 2-1 win for his side. Also due back in contention is midfielder Alex Lawless, with the former Forest Green man having missed all but three games this season due to injury. Boss John Still rested him on Tuesday as the player was 'stiff' after playing three straight matches. The club has a number of available dates for companies, clubs, and groups of friends to book their Christmas Parties at Edgar Street. Dates available are Saturday 7th, Thursday 12th, Saturday 14th, Sunday 15th, Thursday 19th, Friday 20th and Saturday 21st December. Anyone interested in booking can call 08442 76 1939. The Club are looking for Ball boys and Ball girls for tomorrow's match. Anyone with children (over 7 years old) who is interested is asked to email the club on webpages@herefordunited.co.uk to register their interest. Update: The places have all been filled. The club thanks all that have applied. Barnet boss Edgar Davids says he does not fear the sack as he doesn't have a contract. The 40 year old returned to playing on Tuesday but couldn't stop the Bees recording their fifth match without a win. Aldershot have signed young keeper Nick Pope from Charlton on loan. The 21 year old ended last season on loan at Cambridge, making nine appearances, and signed a new three year deal with the Addicks yesterday. Kidderminster report that former Bull Jamie Tolley has suffered a setback in his recovery from injury. The much travelled 30 year old has made only one appearance this season, and is reported to have reinjured his achilles while recuperating. Nuneaton have 'resumed' the loan of Birmingham defender Amari'i Bell. The youngster played a key part of their rise up the table, but they have lost both of the matches since his recall. Tamworth pair Lee and Stuart Hendrie have left the club and signed for Corby Town. Lee is yet to play this season after reversing his decision to retire, while younger brother Stuart made one start and one sub appearance for the Lambs. Cambridge boss Richard Money says their budget is based on gates of 2,000 and any claims otherwise are because of jealousy from their big-spending rivals. Braintree have announced that they will seek approval for promotion to the Football League for the first time in their history. The approval would mean they are eligible for promotion should they finish as Champions or play-off winners. Hereford United's Starlite Rooms are going 'Caribbean' on Sunday October 6th in aid of St Michaels's Hospice. And Bulls' director, Nick Nenadich, is one of the organisers. The Starlite Rooms will be transformed with palm trees, some sand, deckchairs, and a steel band called Pantastic. A Caribbean lunch will be served. "We are hoping to raise some money for the Hospice which not only cares for terminally ill people but also has been instrumental in the understanding of pain management, giving people a better quality of life," said Nenadich. "Please come along and have a quiet Caribbean lunch with the gentle tones of the only home grown Herefordshire Steel band Pantastic. Existing shareholders have been offered 282 new shares for each existing share they currently hold. They have about three weeks to take the club up on the offer to retain their existing percentage of the shares in issue, with each existing share qualifying for £70.50 of new shares - all of which have to be paid for with no multiplier in effect. After October 21st, when the offer expires, the remaining shares will become open for anyone to buy at any level. It has been suggested that £500 of shares will enable someone to receive copies of the accounts and attend shareholders meetings like the AGM, but this has not yet been confirmed. Hereford United chairman David Keyte was pleased that today's shareholders meeting had given the board the nod to proceed with a share issue designed to bring fresh investment into the club. "The share issue has been something we've been working at for some months and as the weeks go by we keep saying it's struggle and we're looking for a step-change and now we've got the opportunity to forfill that," Keyte told BN. "However all we've done is to get to the starting line but a decision to do nothing would have left us exactly where we are which is proving week in week out to be increasingly unviable. "So we've had to lift the ceiling on the total of shares available to get to that point to find out if there is anybody out there that would want to step forward. "Very pleased, I hope that we've given everybody the chance to raise their concerns and to discuss them throughly so even if there was somebody who didn't vote for it at least they have left the meeting having had an opportunity to make their case." Current shareholders now have just over three weeks to decide whether to purchase their entitlement to more shares. "After 5pm on October 21st, by when we hope that the current shareholders will have taken the opportunity of maintaining their percentage of the ownership, it will then be open to new investment and also to the conversion of loans to shares. "Hopefully we'll have a busy few months." Because of the nature of the share issue the board can not advertise that outside investors will be available to purchase shares. How will you get around that? "Technically as a private limited company we can not overtly advertise the share issue. "We can't put a big sign up saying come and buy but we hope that there is sufficient publicity from it, from the likes of Bulls News etc, to make everybody who may have an interest aware of the possibility of buying shares. "And we would like to hear from them.". Hereford United shareholders have agreed that the proposed share issue can go ahead. In a meeting earlier today in the Starlite Room, shareholders voted by 79% to 21% for the two resolutions put forward by the board to give them the power to proceed with the issue. Including top table around 25 shareholders were present at the meeting. Before the vote quite a long period was taken up with discussion of matters pertaining to the share issue. In particular there were questions about the company's articles of association and why the board had decided on 25pence as the value of the 'new' shares. The present position over the leases of the ground was mentioned as some shareholders felt once the revised leases with the council were finalised this could have a bearing on the share price. The chairman, David Keyte, noted that the five ideas for the receipts of the share issue as had been proposed in the earlier documents sent to shareholders were not set in stone. There was a feeling that a small proportion should go to the playing budget. Mention of the loanees to the club was made. More money had recently been put in to keep the club ticking over and the chairman again stressed that the board could not continue to back the club with cash. Then the result of the vote was annouced. 18192 'shares' in favour and 4832 'shares' against. So the issue will go ahead and as shareholders left the meeting information about how they can apply for 'new' shares was available. Cambridge defender Scott Garner says he will not be returning to the club after his loan spell at Boston ends. The 23 year old told the local Boston press he 'doesn't really want to go back or associate with the people there' despite his loan spell ending in December. An unnamed bidder in talks to buy Barrow has pulled out. Negotiations had been ongoing for a few weeks. Gateshead have appointed former Spurs midfielder Darren Caskey as their new assistant manager to boss Gary Mills. The 39 year old replaces David Rush, who was no.2 to Anth Smith. Caskey has been no.2 at Ilkeston until his appointment with the Heed. Southport report that their October 8th match with Wrexham will be their 1,500th in non-league football since their relegation from the League in 1978. Tamworth boss Dale Belford has asked his team's fans for patience after a string of poor results was halted with a win over Forest Green. The local press reports that 19 Tamworth fans watched the victory. In his notes from last night's programme, David Keyte is disappointed that fans have been discussing tomorrow's share vote on 'unofficial' platforms. He wrote: "In my view, a formal meeting will always be the appropriate time and place to debate issues, answer questions and decide upon the best way forward for Hereford United Football Club (1939) Ltd.
"It is totally inappropriate and unprofessional to publicise the financial dealings of a Private Limited Company through the realms of unofficial websites and forums, and thus attract opinions of non-shareholders. "They, understandably, are often ill-informed opinions as, to be fair, they are not privee to the facts." Meanwhile, Bob Pritchard has also used the programme to expand a little on the proposals for redevelopment. In a lengthy piece in the magazine, he says the club will now enter three separate leases for the ground of 30 years each with the option to extend them to 250 years 'on disposal of any of the development land at either end'. Pritchard adds that the latest delays to agreeing the leases have been in order to 'avoid any future tax liabilities'. He also expands information on the previously announced stands, a 2,000 capacity terrace at the Meadow End and a 1,200 seat stand at the Blackfriars End. The Blackfriars End proposal is for a five storey building totalling 60,000sq ft, with hotel, office, retail and residential use under consideration. The Meadow End would see a 24,000sq ft four storey construction, with a proposal to joint-market the site with the Council to improve the value of the site. Luton Town has been given room for 1359 supporters when they take on Hereford United at Edgar Street on Saturday. In the 1359 are 469 seats and 890 terrace places. The Blackfriars End will be available if required. Yesterday they took 731 to Woking for an evening fixture. Last November Luton brought just 372 supporters for a Tuesday night fixture. And to make matters worse for the Hatters, the Bulls won the game 1-0 thanks to 'a 55th minute wonder strike from James McQuilkin' . Brian Smikle scored for Altrincham in last night's win over Gloucester. The goal can be seen on Facebook here. Gary Hooper scored twice on his full debut for Norwich in the League Cup. The 25 year old £5million striker netted late on to force their game with Watford into extra time, then netted the winner to send the Canaries into the next round. In a report to members, Portsmouth's Supporters Trust reports that the club are now paying just 27% of turnover to their playing staff. Due to income being well over their forecasted level, they have cut their expected first year losses this season by £250,000. The Trust hold just under 60% of shares in the club, with the 'Presidents', the individuals who stumped up large sums to allow their takeover, holding the rest. Lincoln City manager Gary Simpson told the press that he and his players were disappointed to have lost at Hereford last night given he felt they had worked hard. “The players are very disappointed because they worked hard tonight,” said Simpson. “Hereford had their tails up, but in the first half we completely dominated the game. “We know we have to work the keeper more, we know that, but we’ve got what we’ve got. “They were more direct in terms of putting it in there and we had to try and battle with them to win the headers. That’s their style of football. Simpson also admitted that he took striker Ben Tomlinson off as he was concerned that he might get sent off: “We were conscious for Ben Tomlinson because he had been booked and he is the last person I wanted to be sent off, so we took him off as well."